It was one of these extremely rare days of calms seas far north in the world. When visiting the Arctic coasts of Norway, I often joke and say that the climate here is the same all year around, low temperatures, windy and in general very unpredictable weather. You can have blue skies one minute and rain pouring down almost horizontally! within the next minute. But this was not the case on this day, the 23rd July 2018. The temperature was reaching a whopping 32 Celsius and there were almost no movements of the air. In fact it was so hot, that the only livable place to be for a northerner was out in the open ocean. As we were basking in the Sun out in open waters, escaping the scorcing heat, chilling on the green RIB, I discovered a moving dark spot far away, breaching the surface that was so calm it almost identically mirrored the sky above us. As we approach the moving spot, we realized it was another creature basking in the sun, just like us. You guessed it? It was a basking shark! The basking shark is a red listed fish, the second largest fish in the world, only outsized by the whale shark. The basking shark can be 13 meter (30 feet) long and weigh up to 8 tons. Experiencing this huge, in this case 7 meter long, shark was literally jaw dropping. We were in awe and I was downright euphoric. If you watch the video, please accept my apologies for making ridiculous comments and sounds. I just could not help myself. This gigantic animal moves elegantly just below the surface, hence the name basking shark as it may look like they want to bask in the Sun like we do. Their motivation is closer related to survival than leisure though, as it is near the surface where they find zooplankton during summer time. The basking shark has extremely large jaws. When the shark opens its jaws it looks rather intimidating. This shark is however not looking to eat humans like you and me. We are safe, luckily. The gills are filtering masses of seawater, as much as 1.5 million litres pr hour, to capture the desired zooplankton. 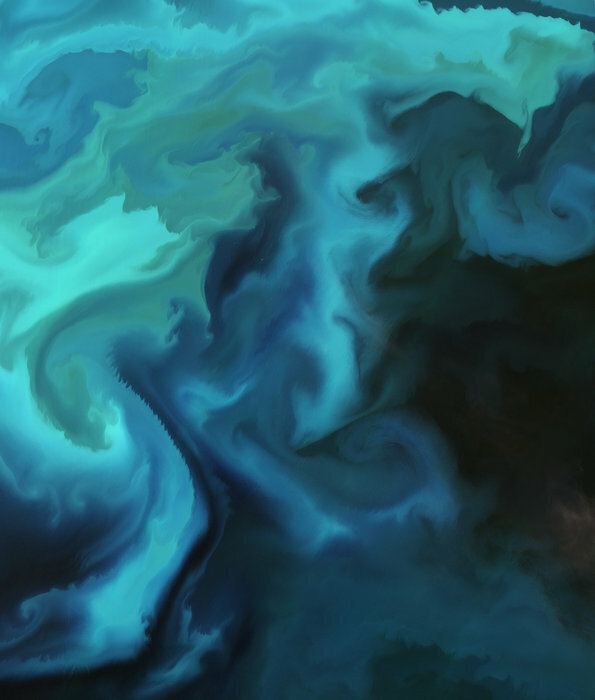 The basking shark is one out of three types of sharks that feed on plankton, the before mentioned whale shark being among them and third being the marmouth shark.When you look at the gorgeous satellite images like these from Copernicus showing the plankton bloom, you now know this is a delicious dish for the basking shark who migrate to these types of areas. It makes perfect sense that you can observe the basking shark in the arctic waters around Saltstraumen, the worlds strongest malstrom. Both sigthings of the basking shark were in Saltenfjorden, the fjord connecting the tidal current phenomena we call a malstrom and the open ocean. In the video we are located in the outer parts of Saltenfjorden with direct views towards open ocean. The last couple of weeks, the summer warmth finally came to this area of Norway. It was a very cold June so everything was late this year, but with the exceptional warm days of the last part of July, the basking shark must have considered this area ripe for eating.In the satellite image by NASA below you see that there are some interesting patterns formed and made visible thanks to the plankton, our basking shark’s favorite dish. 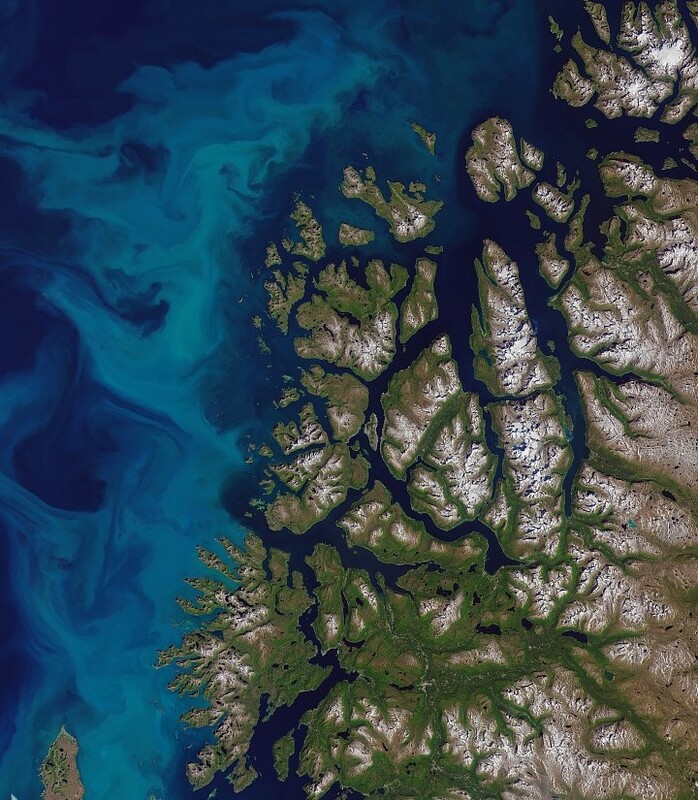 Saltenfjorden, Norway by NASA. The red circled area is where the basking sharks were observed. It is believed that the basking shark’s movements, the fins breaching of the sea surface, and the size of this fish may have inspired the creation of the sea monsters you find in old maps. I have included some links to more reading about these old maps and their wonderful monsters below under "References". 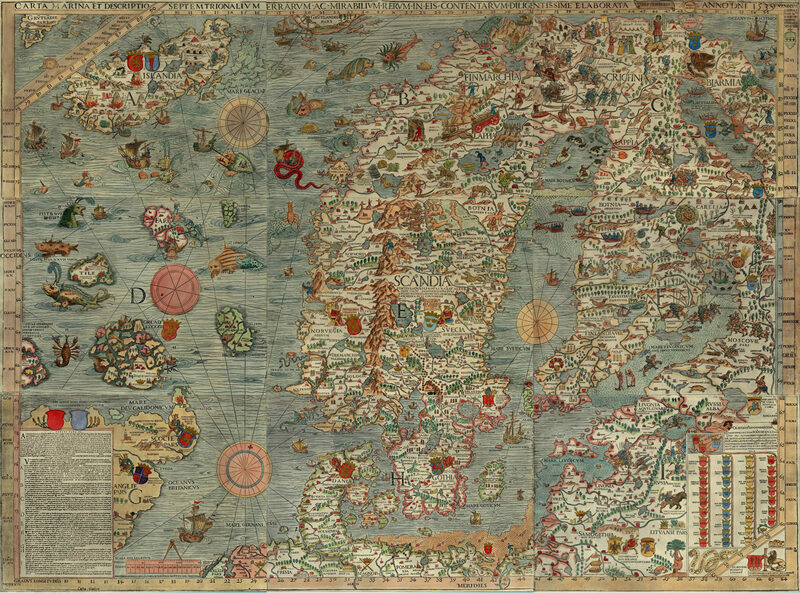 In this famous old map Carta Marina of the Northern countries (1539), you find a whole lot of these famous sea monsters. It is believed that the basking shark inspired the creation of some of these wonderful creatures. Wikipedia[/caption]Another interesting characteristic of the basking shark, I find, is the growing of shellfish all over its body. The white areas and spots you can see in the video, are evidence of that, and the skin of a basking shark feels like a sandpaper and will roughen you up if you get too close to it. Divers are advised to keep a distance for this reason. I knew we had sharks along the Norwegian coasts, including in our Arctic waters. According to the Institute for Marine Research in Norway, there are 4 types of sharks on Norwegian ocean territory; the common Spiny Dogfish (Squalus acanthias) , Greenland shark (Somniosus microcephalus), Beaumaris shark (Lamna nasus ), and the basking shark (cetorhinus maximus). The basking shark was hunted in the same fashion as whales here in Norway. They shot the fish, dragged it to the boat, turned it around and opened its belly. As much as 25% of the basking shark is liver, and this liver was the main reason for hunting the fish. When the belly of the fish was opened, this liver floated up to the surface where it was shuffled on to the boats. The Asian market is big for shark fins, especially Japan is willing to pay for basking shark fins and this is unfortunately still threatening this species. The basking shark oil that used to be the main reason for the hunt whereas there is no longer a market for fish oil from the basking shark liver.In Norway there were a lot of basking shark fishing out on the Røst banks on the outside of the tip of the Lofoten archipelago in the 1950-60s. The fishing took place all summer long, mostly by fisheries further down south along the Norwegian coast, says Jørgen Jørgensen from Lofoten. Jørgensen grew up in Lofoten being part of the traditional Norwegian fishing culture. A wide-ranging Norwegian fleet has undertaken the major basking shark fishery in the northeast Atlantic from April to September in most years. Catches were high (>1,000 and up to >4,000) from 1959-1980 (Kunzlik 1988, ICES data, in Anon. 2002c). The Norwegian quota in European Community waters was 800 t (liver weight) in 1982, 400 t (approximately 800-1,000 sharks) in 1985, subsequently reduced to 200 t, 100 t, and to zero in 2001. Norway, a big fishing nation, was one of the biggest providers of basking sharks, delivering fish especially to the biggest consumers of the shark in Asia.As you find the basking shark in temperate oceans around the globe, there were fisheries on both hemispheres and still are in Asia. Today the basking shark is however protected in most parts of the world. Globally it is considered vulnerable by the IUCN, in the European Union it is registered as an endagered species, protected by law. Norway has granted it the highest degree of protection. Tourism - a new industry that can help protect the basking shark? During my research on the basking shark I found that there seem to be a growing new industry based on this large oceanic animal. The adventure tourism is a niche that is increasing with many different types of nature based explorative experiences. Whale safari and orca safari are both popular in Norway along with northern light tourism just to mention a few examples from the Arctic and cold regions. What I discovered when reading about the basking shark was that they migrate with sufficient consistency to the Irish and Scottish seas in particular. So much so it has formed the basis for a basking shark tourism. Moreover, I was delighted to learn that they combine this tourism with scientific activities such as collecting and sharing the many observations of the shark. In fact, I have the impression that these tourist communities are more updated with respect to knowledge about the basking shark than the authoritative research organizations. Observations of the shark breaching the surface have been done with the help of tourists. Companies even use the scientific program as a selling point. It is clear that we still know little about the basking shark, how and when it migrates, the breeding, their social life etc. By combining observations of the individuals and observations of the physical conditions such as ocean currents, size and timing of blooms, sea temperatures etc, we can learn more about this egnimatic creature. For me it was a great experience seeing it in its natural habitat, being close to it on several occasions in beautiful surroundings. I will never forget it.It is inspiring to discover that there is currently a win win win situation in that conservation of the shark can be supported by a new tourist industry that help produce new knowledge about the little known basking shark through citizen science and public private partnerships. As I work with Earth observations and I truly appreciate their importance for all areas of society , I will make sure that my experience is translated and recorded for scientific use. There is one simple way of doing that, and that is to register my observations with Global Biodiversity Information Facility GBIF. I will use my newly won knowledge about the basking shark in my research and innovation activities. It is interesting to test how these types of observations (citizen science) can be combined with satellite data (Copernicus, GEOSS and others) and other variables from authoritative sources e.g from the Institute of Marine Research, European Environmental Agency, NOAA etc. You can read more about this activity at NextGEOSS, a European Horizon 2020 project building the next generation European data hub and platform. The second largest fish in the oceans fit both in the Cold Regions and in the Biodiversity pilot. And that is just for starters. I am sure there are many other fits for the basking shark, through GEO Blue Planet initiative for instance there must be a lot to do for marine biodiversity experts, oceanographers and so on. It is funny that these events, the first time I ever saw a shark in my life, happened during Shark Week 2018. There are several thrillers about sharks, creating a skewed image of these fabulous animals. The basking shark gave me a great thrill alright, but I was never afraid. As one shouldn’t be! Did you ever see a basking shark? Let me know in the comments! Enjoy further reading from the references I have collected on this occasion.